THE SONORAN DESERT, an arid region of western North America, covers an area of 120,000 square mi (311,000 square km) in southwestern ARIZONA and southeastern CALIFORNIA, most of Baja California, and the western half of the state of Sonora, MEXICO. It is one of the largest and hottest deserts in North America and has two primary subdivisions, the Colorado and Yuma deserts. A bimodal rainfall pattern produces a high biological diversity. The Colorado Desert, forming the western part of the Sonoran Desert, is closer to the source of Pacific storms and is noted for spectacular spring flowering of ephemerals when there is winter-spring rainfall. Pacific winter storms nourish many West Coast annuals (poppies and lupines), and summer monsoons host both annuals and woody plants originating from the south. Trees are usually well developed on the desert ranges and slopes; abundant on well-drained soils are little-leaf paloverdes, desert ironwoods, catclaw, and saguaro. The understory consists of three to five layers of smaller woody shrubs. Tall cholla and saguaro cacti occur in a multitude of species, and the endangered acuña pineapple cactus is also present. 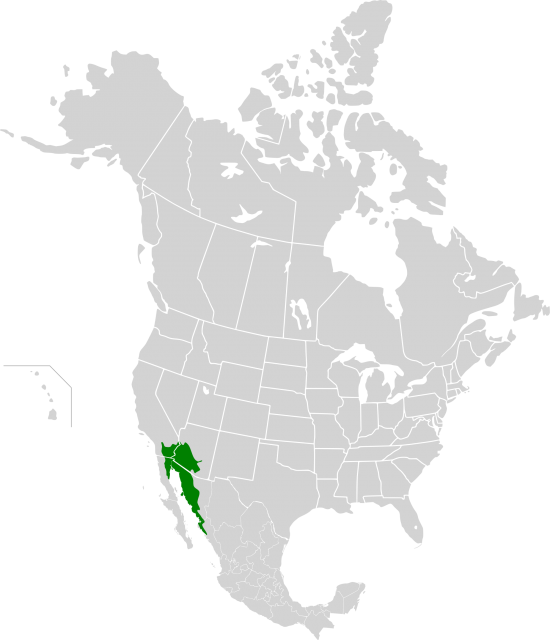 Alluvial lowlands host communities of desert saltbush, wolfberry, and bursage. Creosote and bursage plant communities are common on coarser soils. Modern irrigation has created fertile agricultural areas, including the Coachella and Imperial valleys of California. More than 2,500 species of flora support a wide variety of fauna, including the endangered Sonoran pronghorn, desert bighorn sheep (especially in the Maricopa Mountains area), and other mammalian species such as mule deer, javelina, mountain lion, gray fox, and bobcat. More than 200 species of birds are found, including numerous raptors and owls, particularly elf and western screech owls. A diverse array of reptiles and amphibians, including the Sonoran desert tortoise and the red-backed whiptail, are also supported. The region contains numerous significant archaeological and historic sites, including petroglyphs (rock art), lithic quarries, and permanent habitation sites, particularly along the bajadas of the Table Top Mountains. Vekol Wash was an important prehistoric travel and trade corridor between the Hohokam and tribes located in what is now Mexico. Villages were occupied by the ancestors of today’s O’odham, Quechan, Cocopah, Maricopa, and other tribes. Among the historic trails are the Juan Bautista de Anza National Historic Trail, the Mormon Battalion Trail, and the Butterfield Overland Stage Route. The Sonoran Desert National Monument was designated by President Bill Clinton in January 2001. The saguaro cactus forests within the monument are regarded as a national treasure, rivaling those within the Saguaro National Park.